Is this just a bottle of shaving cream? 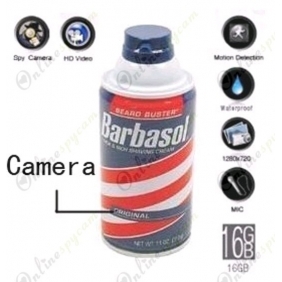 In fact, it is a perfect combination of shaving cream with detective pinhole camera. Do you want to know what happen when you are out? If so, this Spy Bathroom Shaving Cream Pinhole Camera can be your reliable assistant.This product seems like an ordinary shaving cream. In fact, it is a professional spy camera. The pinhole camera is set inside the bottle, so there is nothing unusual in its appearance. The camera can be remote control. It means that when you want to shoot something, you can use a remote controller to operate the working of the camera in a long distance. It’s convenient and the operation is quite easy. To get good-quality video image, the resolution of the bathroom spy camera is up to 1280*720. In order to add the shooting time, a large capacity battery and a 16GB memory card are set internally and the camera can work last for about 10 hours. If you want to get the most authentic evidence for a variety of illegal behavior when you are out, this is a helpful product for you.